We still haven't got used to the fact that Winter months are in June, July and August. So given the persistent grey and dreary days of recent weeks, we decided to grab a week away and find some sun. Everyone said "ah you must got to Noosa!" To be fair just all I spoke to didn't have a bad word to say about this part of the Sunshine Coast. Restaurant recommendations and places to see soon came flooding in too. Even the name the Sunshine Coast fills you with feelings of warming rays and lazy days lounging by the surf. It sounded just the job. Noosa is easy. It is set up as the perfect beach resort and Mother Nature has provided all the required basic ingredients. A stunning sandy beach with just the right amount of surf to make any wannabe-surfer dude feel like a pro, a beautiful wide river mouth to tempt all fishing enthusiasts and a totally unspoilt national park with breath taking coastal walks and tranquil, lush forest trails to meander through. We stayed in Noosa Heads at the Tingirana Beach Resort overlooking Hastings beach. The apartment was fabulous, all mod cons and a lovely big balcony where we watched the world and their surf boards go by. Right behind us was the very chic and fashionable Hastings Street Strip teeming with colourful boutique shops, bars and restaurants and a good smattering of ice cream parlours and coffee shops. However, I did approach the holiday with some trepidation. Would I be able to keep my pioneering, adventure seeking Husband pinned to just one place for a whole week? Would my venture scout cope? Well I needn't have worried too much, I think you can see that we both adapted to our environment quite quickly. One of the great features of the beach was this board walk that went the whole length of the front. Perfect for wheelchairs and pushchairs and those who were not sure footed. It gave easy access to all the cafes and restaurants and I was pretty impressed. Well I must have been feeling demob happy because I actually got into the water, something I hardly ever do unless I am donned in a full wetsuit with a couple of tanks on my back. ..... these little critters were the reason why. There were a few blue stingers floating around and although not highly dangerous, they will certainly give you a good "nettle sting". I think they are really quite beautiful and I became very annoyed and perturbed when I saw a little boy belligerently stabbing one with a stick as his Father looked on without a care. 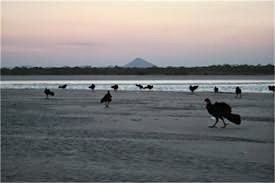 There was no doubt tho that we were on a beach holiday in Oz, all the classic images were there in spade fulls. Young, old, expert and beginners alike all took to the surf. It made for fascinating viewing and a few giggles at some spectacular fails. And no Aussie beach would be complete with out the ever present "hunky" lifeguards. Of course I bagged the hunkiest one for myself! It was also really exciting watching the surf club practise their life saving techniques. The photo does not depict the speed that they were rolling in at, at all but it was exhilarating to watch. I would have loved to have hitched a ride on board. We were also able to indulge in our passion for seafood in a big way. Whether for lunch or dinner, we found it virtually impossible to swerve the Hervey Bay Scallops, the Coffin Bay Oysters or the juicy Malloolooba Prawns....even on pizza! Even breakfast was a gastronomic delight, albeit seafood free. Hubster adored the smoked ham hock baked beans with poached eggs and sour dough. However, Noosa was not just about the beach life, just a 10 minute walk away from our resort and we were in the National Park. The walks were really beautiful and it will be of no surprise for you to learn that we covered absolutely EVERY walking trail there was. My venture scout Hubster, armed with his trusty map and innate spatial abilities, ensured that we did not leave an inch of the trail unfettered. The 10km treks certainly helped ward off the effects of our culinary indulgences and our much sought after sun downers. We tramped high up on the cliffs, across virgin, white sandy beaches and through undulating forest with skyscraper gum trees waving loftily in the breeze. What is more, we encountered very few people, just lovely. The sap oozing from the Red Gum Eucalyptus really did look like it was bleeding from gaping wounds. Quite graphic in a way. There wasn't a huge amount of wildlife to be seen but the feathery friends we encountered were certainly characterful. Mr Pelican was peacefully resting on a post, no doubt digesting his early breakfast catch. This is the closest we have ever got to a Parakeet, they were so tame and happy to take crumbs from our fingers. Their vibrant feathers really are amazing and just like their adornment, they are pretty loud! 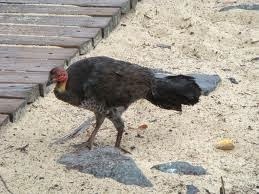 However, most surprising of all were the Brush Turkeys. They were absolutely everywhere and no-one batted an eyelid as they nonchalantly wandered on the beach, up the road and through bars and restaurants looking for rich pickings. So all in all our first beach resort holiday in a very long time was a roaring success. I am hoping to convince Hubster of more of the same ilk for the future. Mrs TJ signing off with many happy memories.